In just four days, the Vancouver 2010 Winter Olympic Games will commence. You can be sure we’ll be pulling for U.S. Ski Team member Torin Koos, a cross-country skier we’re extremely proud to sponsor. As a native of Leavenworth, Washington, Torin grew up in the heart of pear country. He checks in with us regularly with postcards, photos, training videos, and his reflections on training and competing in the Olympics, a dream he’s had since he was a child. In addition to his love for skiing, Torin also enjoys writing. In fact, he’s in the process of getting a master’s degree in communications at Westminster College. He recently sent us an article called “Raise High the Roof Beam, Carpenters” which we’re very pleased to share with you. It’s a quiet Sunday night as I begin to write. At first it’s all stuttering and stopping, cross and erasing. The creative complexity of writing, of making language flow from thought, escapes me. I’m trying too hard. I’m thinking too grand. I go back to the basics. Write about what you know. Use single, short declarative sentences. Always seek the active voice. Show, don’t tell. Write. Put pen to paper. Then, only then, let the inner copy writer’s voice come out. Finally it comes. Yes, this is it. If I had to compose a group of words to live by, these might be mine. It’s on the outskirts of the Banff National Park where I find myself for the last days of preparation before heading West to Whistler. Isn’t this the way it always is, headed West, leaving the stepping stones behind for the land of new adventures and experiences? In my mind’s eye I can see the big mountains as I can breathe in the wet, slightly salty maritime air. Ah, sometimes life’s too good, isn’t it? Writing these last lines reminds me about what it’s all about – the universal appeal of sport and the Olympian’s quest. It’s to fully inhabit the most traditional and hallowed sense of the word amateur; a lover of. What a feeling it is to wake up every morning, pop out of bed, let out a big, boisterous Shazaam! and get right to it, loving every minute of the process. Maybe it’s encouraging to know (somehow, it is for me anyways) that this state of perfection is beyond most Olympian’s daily way and means. This, though, is the personal standard. The one most worth striving for. When you get to this level, hold it, cherish it, nourish it, share it and carry it’s memory with you always. I’ll try to do the same. A friend says, “It’s so easy to die before the fact of it.” This reminds me of the Jack London penned poem, the work urging one to be the spark that burns out in a brilliant blaze, to be that meteor, every atom in magnificent glow. To this I say, raise high that roof beam, carpenters! To use every fibre of our bodies in taxing effort, to beat back the deadening effect of habit, to abhor merely existing and instead shine, shine, shine like that exploding star shooting across the dark night sky. Visit the new USA Pears store, at www.usapearsmarketplace.org to purchase a limited edition Torin Koos trading pin. All proceeds from pin sales will benefit one of Torin’s favorite charities, The Boys and Girls Club! This entry was posted in Torin Koos and tagged athlete, Jenny, pears, Torin Koos by Jenny. Bookmark the permalink. Hello! I write about all things pear, from local events to online sightings. 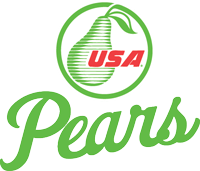 Check out my posts for fun and creative ideas involving USA Pears!